This article takes an in-depth look at the innovative work of communities that are part of Starting Smart and Strong, a 10-year place-based initiative in Oakland, San Jose, and Fresno funded by the David and Lucile Packard Foundation. Many young children have experienced traumatic events or live in conditions of extreme stress. Nationally, one in four preschoolers have experienced trauma firsthand, and one in three have witnessed violence. Such trauma — including neglect, abuse, or violence — can overwhelm a child’s healthy ability to cope, regulate emotions, develop, and learn. While early childhood educators can’t control traumatic events in the lives of children, they are uniquely positioned to help: Research says an attuned, responsive, and regulated caregiver is one of the most important interventions that can help support a child to mitigate the negative effects of trauma. 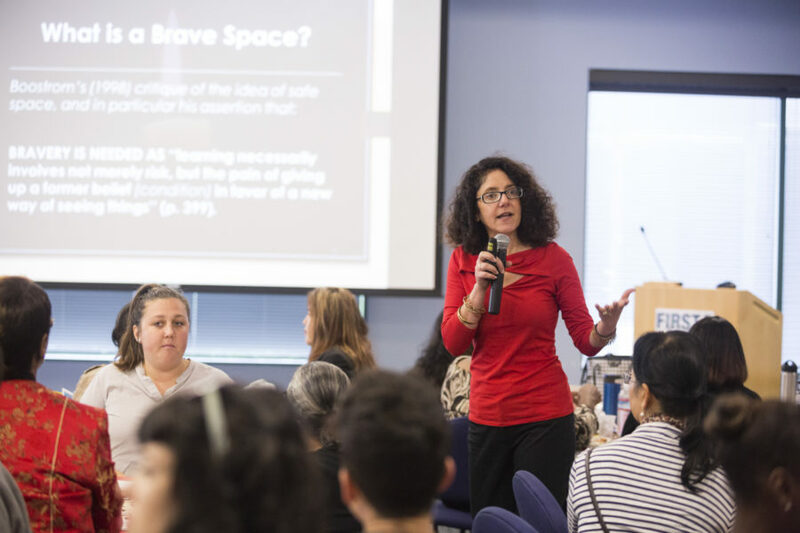 Learning practices to build resiliency (defined as the ability to withstand adversity, adapt to past adversity, and recover from adversity) is the goal of Oakland’s new Trauma Informed Practice (TIP) project, which launched in September 2017. The kickoff of the project was a daylong training called Understanding Trauma Informed Practices for Early Childhood Programs. 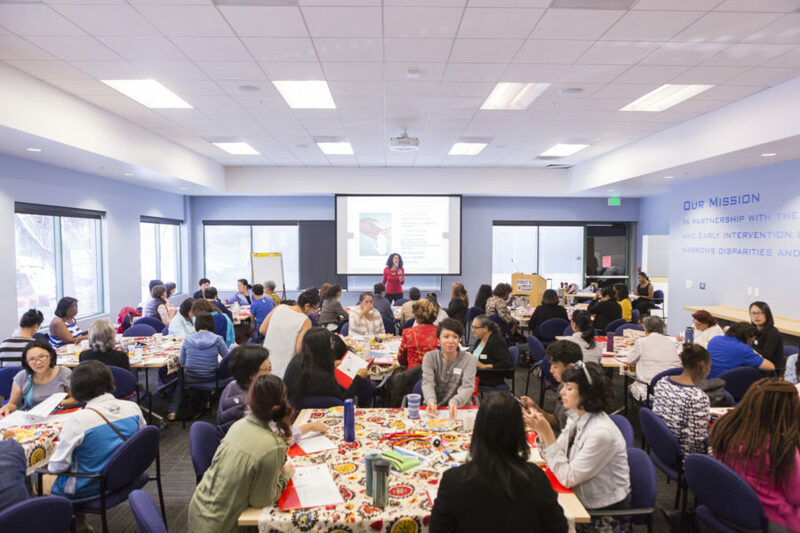 Here, a group of Oakland early childhood educators gathered to learn about practices and strategies that build on children’s strengths within their environment to support their health and healing. It’s an issue that is drawing the attention of many of Oakland’s early educators. The training was offered to the City of Oakland Head Start and the Oakland Unified School District, the two largest providers of early childhood education in the city, and reached maximum capacity just days after being made available. To meet the demand, there are already plans to offer additional trainings to more teachers. The work happening in Oakland and around the country falls under the umbrella known in the mental health field as trauma-informed care (TIC), a framework that involves understanding, recognizing, and responding to the effects of all types of trauma. The trainings are part of the 10-year Starting Smart and Strong initiative, funded by the David and Lucile Packard Foundation. 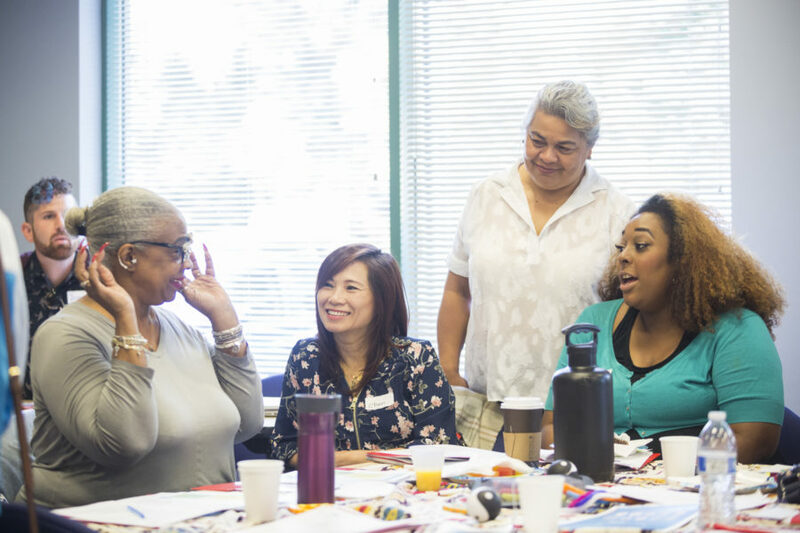 Since its inception three years ago in three communities — Oakland, Fresno, and San Jose — each has chosen a project focus area, and professional development models have evolved based on their most pressing needs. In Oakland, the need for understanding and addressing trauma and toxic stress rose to the top. Spearheaded by the Oakland Unified School District, the Trauma Informed Practice in Early Childhood Education (TIP-ECE) project brings an impressive array of organizations to the table, including the City of Oakland Head Start and Early Head Start, New Teacher Center, WestEd’s Center for Child and Family Studies, Alameda County Early Care and Education Program, and the Early Learning Lab. Collectively, these organizations are co-designing and implementing an effective professional development model focused on integrating trauma-informed practices. This is part of a broader effort in Oakland to elevate the importance of trauma-informed practices, including the Resiliency in Communities After Stress and Trauma program (ReCAST) and the Trauma Transformed regional center and clearinghouse. As a partner, the Lab is supporting the community stakeholders as they co-create a TIP professional development model to meet the needs of the Oakland community. This includes refining Oakland’s TIP-ECE approach and co-designing and implementing three central professional development activities: Professional Learning Communities (PLCs), coaching, and self-reflection practices. The effects of trauma have been studied extensively. However, a training for early childhood educators on the effects of stress on children and strategies to support healing and resiliency is unique. The overarching 10-year Oakland Starting Smart and Strong initiative is also unique, because it focuses on innovative and evidence-based professional development that will build trauma-sensitive early learning environments for the long haul. 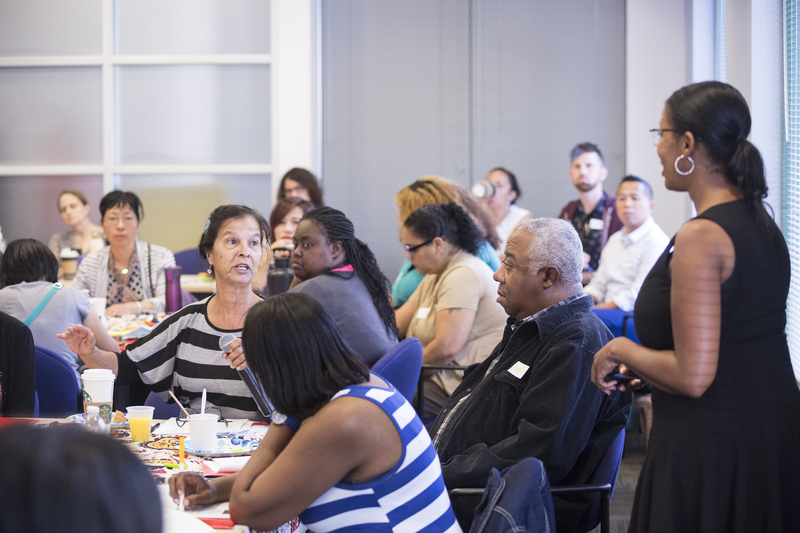 To do this, the project brings together experts in the field: Trainers Julie Kurtz, WestEd’s regional director for the Center for Child and Family Studies, and LaWanda Wesley, coordinator for the Local Care Planning for Alameda County, led the workshop. Along with advisers Julie Nicholson and Linda Perez, professor of early childhood education at Mills College, these experts are adding their invaluable expertise and guidance on this complex topic. This first training underscored how trauma can overwhelm the brain, negatively affecting the ability to form relationships, think rationally, and follow directions. “It’s really important to know how their brains work. When you understand the process, then you know what to do. You know how to handle each situation,” says Joyce, a Head Start teacher. Providing teachers with strategies to build caring relationships and environments, identify trauma triggers, and apply trauma-informed practices during the day was another key part of the training. Teachers learned how triggers such as a new person entering the environment, loud noises, transitions, or an angry tone of voice can be dysregulating for children and cause some to lash out or withdraw. The training offered teachers a range of trauma-informed strategies to help children reduce stress and develop self-regulation skills, including dimming the lights, humming or singing, rocking or bouncing, and spending time outdoors. If we really want to move the needle for children who have experienced trauma, we must support teachers in building self-awareness and self-care to nurture their own well-being. The training addressed this face-on, encouraging teachers to reflect on their own lives and trauma histories. Trainers encouraged teachers to use some of the same strategies they can use with children: staying attuned to sensations, identifying their triggers, and expressing themselves in a healthy way. This is hard work, but the underlying belief is that if teachers strengthen their understanding of their own reactions to traumatic stress, they are likely to have more empathy for children who have experienced trauma in their care. Now that the project has launched, the Lab is working with project partners as they advance the key elements of the professional development model to keep it moving forward: PLCs, biweekly coaching sessions, and participant self-reflection logs. Feedback from the trainings and all other project activities will help identify the elements that have the most impact. This responsive model is crucial to keeping the project dynamic and the teachers engaged. As the project gains momentum, the partners will continue to use ongoing feedback on the effectiveness of the co-designed features to refine the model. The field continues to look to science for hope and inspiration for the future. Kurtz reminded the group that in the past, common wisdom was that the brain was fixed: Once it was formed, it didn’t change. That idea has evolved based on the relatively new science of neuroplasticity. We now understand that the brain can create new neural connections in response to new experiences and environments. This means that even children whose brain development has been negatively affected by trauma can heal. By creating safety and developing healthy bonds, teachers can literally help kids become resilient and rewire their brains to live happy and healthy lives.